Abuja, Nigeria. 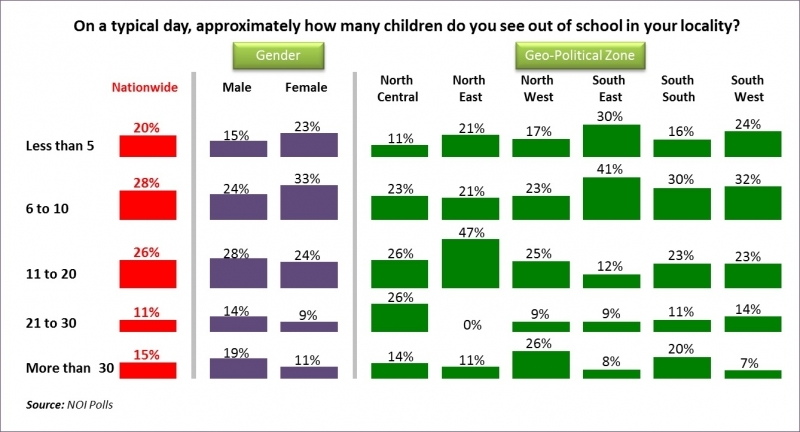 June 25 2013 – Latest weekly Snap Poll results released by NOI Polls Limited has revealed that about 8 in 10 Nigerians (78%) observe children out of school in their localities each day. Also, the poll revealed that almost 6 in 10 (57%) Nigerians support the recent claim made by UNESCO that Nigeria has the highest number of children out of school. These are two of the key findings from the recent Public Education Snap Poll conducted in the week of June 17th 2013. Children out of school are the number of school-age children not enrolled in primary or secondary school. The UNESCO Education for All Global Monitoring Report released in June 2013 states that Nigeria holds the world record of having the highest number of its young people out of school. The report shows that one out of every five Nigerian children is out of school. With approximately 10.5 million kids out of school, Nigeria tops the table of 12 other countries with which it accounts for 47 per cent of the global out-of-school population. Forty per cent of Nigerian children aged 6-11 do not attend any primary school with the Northern region recording the lowest school attendance rate in the country, particularly for girls. Despite a significant increase in net enrollment rates in recent years, it is estimated that about 4.7 million children of primary school age are still not in school. Subsequently, to verify this claim, respondents were asked: Personally, during the course of your day, do you normally see children out of school in your locality? In response to this question, the overall majority (78%) confirm that in their various localities, they usually see children out of school during the course of the day. Comparatively only 22% of the respondents answered negatively to seeing children out of school in their localities. From the geo-political zones perspective, the North-West zone and North-East zones both had the same and highest proportions of respondents (83%) that are positive to seeing children out of school in their localities during the course of the day. This is followed by the North-Central zone with 79% and the South-South zone with 77%. In addition, the South-East zone accounted for the highest number of respondents (30%) that answered negatively to seeing children that should be in school on the on the streets in their various localities.